With many people finding themselves in tough financial times it is not surprising to hear stories of people doing some pretty outlandish things to stay afloat. Something that is becoming more and more common is parents stealing their own child’s identity in order to receive credit lines and loans. Parents that have been caught doing this have received more leniency in court than someone who steals a strangers identity because of the family ties. A recent report from CNN discusses the growing trend and how it effects the children who are after all, innocent victims. 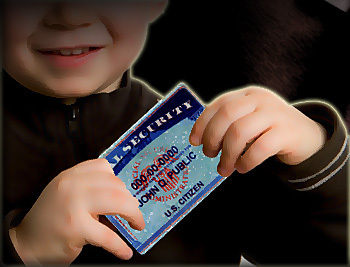 According to Robert Siciliano, CEO of IDTheftSecurity.com, a parent can do almost anything from applying for a credit card to taking a loan out for a house if they have their child’s social security number since credit checks do not currently verify a person’s age. She has not turned her father in to authorities because she believes it would be too much of an emotional burden to bare. Unfortunately, most parents are never caught because of this very reason. Siciliano talks about how stealing a child’s identity usually starts when parents find themselves in a desperate situation, like putting a utility bill under their child’s name to keep the electricity from being shut off. But soon the parent realizes they can use their child’s identity to purchase just about anything. New statistics also show parents are turning to their grown children more and more in order to receive loans. People between the ages of 21 and 28 who are co-signers of their parent’s auto loans has risen by 30 percent over the last two years at LeaseTrader.com. Parents find it beneficial to use their child’s untarnished credit rating rather than their own. What do you think of the latest reports that parents are using their children’s identities to take out loans and credit lines? I think this is a disgrace. Maybe even a form of child abuse. People call in the Suze Orman show all the time talking about their parents doing this to them and how it's ruined their financial lives. I'm not sure what to "do"...but definitely the kids' credit histories need to be made clean. I would say that the parents should be jailed, but I'm not sure this helps anyone either. This is really sad. I love my children and would never harm them in any way shape or form including their credit... My flaws are my flaws and not theirs. I got a better one. My mother did that to me, without my knowledge. I guess back in the days companies did not check much, if they did they would of found out that my social said I was a minor. Therefore I was not legally able to enter in any kind of contract with anyone. Including having a phone service. When I got married and was applying for basic services I found out how far I was in debt. I had to fight to prove that it was done without my knowledge there for I was not responsible, and by law, I was not. My mother put the electric in my name without my knowledge and never paid it. I was 22 and creditors were calling me and I had NEVER had an account in my name, they gave the address and the year the account was opened and it turned out that year I was only 14. They didnt believe me and I went through months and months of harassing phone calls, until I finally changed my number and had it unlisted. I CANNOT imagine doing that to one of my children. My friend's parents did this to her. She applied for a car loan and when the bank pulled her credit report, they discovered a $22,000 credit card bill from an account opened when she was 12. The account was in good standing, which explains why she was not told when she co-signed on a new house for her parents 5 years ago. But the fact is that now she "appears overextended" on paper, meaning that in the eyes of the bank she cannot repay the loans. This means that even though she *can* easily afford to make loan payments that the bank will not give her a loan. She's basically in a hole... the bank manager told her that she will pretty much never be able to get a loan for a car or a house. She was going to get married last month, but she and her fiancé decided to call it off as to keep their finances separate and circumnavigate the mess her parents made for her. It's so sad that the courts don't throw the book at people like this instead of letting them off with a slap on the wrist. This is such sad news to me. I know some people are really down on their luck but doing this to their kids just isn't right. I couldn't live with myself. That is absolutely terrible that parents would do that to their own kids. My wallet was stolen when my oldest was an infant and her Social Security Card was in there. They stole both of our identities. The police said that it was easy to do and it happens all the time, especially to children. I have had real fights on my hands with creditors trying to say that my 14 month old child had a cell phone and store credit cards. Thankfully, the people were eventually caught but it was still a couple years of time, effort, and emotional damage for me. I never carry anything around now that I don't absolutely have to have on me, and I pray that my kids are safe from scum like that. Reading this story really brought back some rough memories for me. Like April and MingMing this was also done to me before I was of age without my knowledge and I did not find out about it until went to apply for an auto loan. As MingMing said years ago companies did NOT care or even bother to do more detailed checking so I also A LOT of problem credit wise due to this. Sadly, I know others - younger than myself who also have gone through or are going through this same thing. It is becoming more and more common these days...I do agree with what was written in this article.